Vauban family is equipped with a living-dining room, 1 double bedroom, 1 bedroom with 2 single beds. 1-2 Schlafgelegenkeiten in the living room. Kitchen and bathroom. Bathroom with shower, towels and hair dryer available. Washing machines + dryers can be used in the communal laundry room. The apartments are located on the first floor and are also accessible by elevator barrier-free. You can find more apartments on our website. The apartment is on the 1st floor and can be reached barrier-free with a lift. Balcony with awning and seating. Non smoking. We came to Freiburg to visit our daughter who is studying at the university. The apartment worked well for the 4 of us and met all our expectations - quiet, clean, spacious, good location, and an over-all attractive environment. We were able to park our rental car a few blocks away for a nominal fee, the tram/shopping a pleasant walk away. Our hosts were friendly and helpful, respectful of our privacy. The patio balcony was a big plus for us. Beds are very comfortable. Vauban is a quiet community with an obvious commitment to thoughtful, intentional, and simple living. We loved being a part of it! Alles prima. Einzig die Handtücher haben leider sehr muffig gerochen. Sonst hat alles super geklappt und gepasst. Es ist uns sehr wichtig unsere Gäste zufrieden zu stellen. Ein Hinweis hätte genügt und wir hätten frische Handtücher geliefert. Unser Betrieb wäscht und reinigt mit umweltfreundlichen, biologischen, wohlriechenden, Allergiker freundlichen Reinigungsmittel. 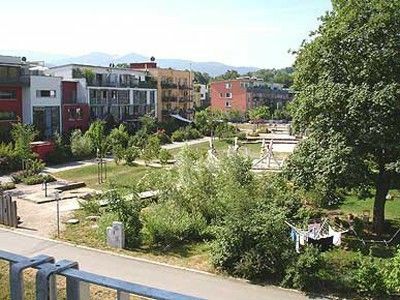 Wir haben die Wohnung wegen des autofreien Stadtteils Vauban ausgesucht und waren begeistert. Straßenbahn vor der Tür, Wohnung in gutem Zustand, so hatten wir es uns vorgestellt. Sehr schöne Wohnung. Alles da, was man braucht. Schöne Wohnung; Sehr gemütlich und in einer günstigen Lage. Wir haben einen guten Aufenhalt in Freiburg verbracht. Die schöne Wohnung hat uns dabei geholfen. Schöne ruhige Wohnung, die auch gut von Familien mit Kindern genutzt werden kann. Die tollen Spielplätze, der nahe Bach und die Straßenbahn waren spannend für die Kinder (3 Jahre und 6 Jahre). On the outskirts at the foot of the Schoenberg it is an ideal starting point for walks and hikes in the Black Forest, on the Schauinsland, Feldberg and the Markgräflerland. For trips to the museums and galleries in Basel or Colmar, in the wine villages of the Kaiserstuhl and in nearby Alsace, this is a central location. Take a trip with your children to the Europapark Rust or the Steinwasenpark. The apartment is located near the tram stop with direct connection to the train station u. to the city. Various shops and restaurants within walking distance are available. It is an ecological passive house in the zero house concept with innovative technologies. There is a large playground in the green area in front of the house, the area is very child-friendly and traffic-calmed. The bicycle shop with bike rental is not far from the house. Other Activities: Yoga, Tai Chi, Qi Gong, Karate. Ski: The Black Forest offers a lot of winter sports: ski lifts Hofsgrund, Notschrei, Todtnauberg u. a .. In about half an hour distance you can reach several lifts and cross-country ski runs as well as the ski center Notschrei. You can also get there by public transport. To Feldberg Liftverbund drive one hour, also possible with public transport. Mietpreis pro Nacht: für 1-2 Personen 70 Euro, für jeden weiteren Erwachsenen 10 Euro Aufpreis pro Nacht. für jedes weitere Kind 5 Euro Aufpreis pro Nacht. Endreinigung 30 Euro.